It's been a while since I posted a recipe, but the past several months have been busy, to say the least. I finished my book, Blotto Botany, which consists of 40 new recipes, materia medica and a section on self care. Needless to say, my recipe mojo was rather dormant. But now that things have seemingly slowed down and my attention is not exclusively devoted to writing the book, I am excited about returning to serving up some new herbal recipes and other plant based offerings. With colder days upon us and the holidays rapidly approaching, I've been jonesing for warm spices and comforting tastes. I came across a video on Tastemade with a recipe for boozy apple cider cups and decided to kick it up a notch with a cordial of my own concoction and caramel sauce. These little apple cups are perfect for winter gatherings by candlelight or quiet nights at home with a good book. Plus, how fun and very Wonka world is it to eat your cup!? Who wouldn't love that? Place all ingredients in a quart size jar and completely cover with the whiskey. Stir, cap tightly and shake. Infuse for 2-4 weeks in .cupboard or shelf away from direct sunlight. Shake daily. After infusion period, strain liquid and store in a clean jar. Side note :: I usually use a fine mesh strainer to strain my cordials, but a cheese cloth or colander will work as well. Using a knife, remove the tops of the apples. Then take a pairing knife and carefully mark the "rim" of your cup, leave about 1/4 of an inch for the rim. Scoop the apple out with a spoon or a melon baller. Once your cups are hollowed out, brush the lemon juice on the inside of the apples to prevent browning. In a large pot, heat the apple cider on medium heat. Add cinnamon, nutmeg and sweetener and bring cider to a low boil. Reduce heat to simmer and add 1-2 cups of the cordial (depending on how boozy you want to get). Stir well and remove from heat. 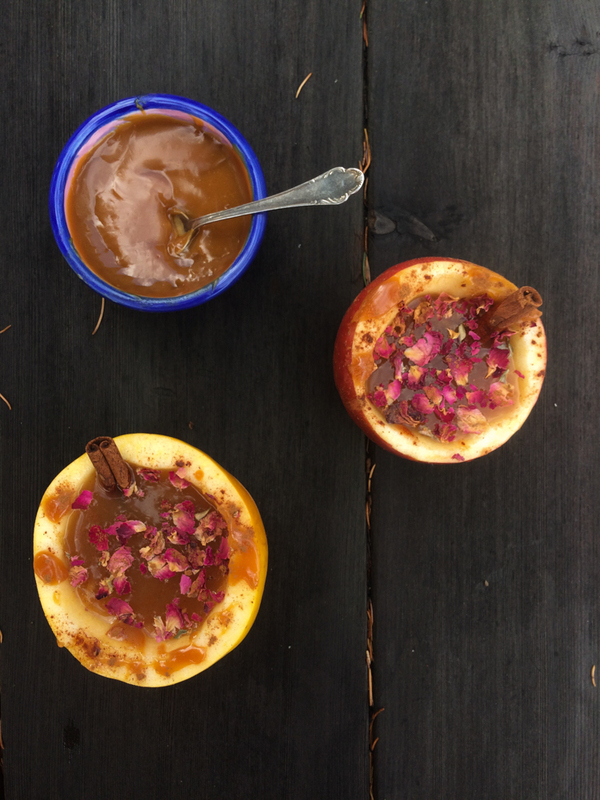 Using a ladle, transfer your cider into the apple cups and garnish with a cinnamon stick, anise star seed, rose petals or caramel. Serve while hot. I use this recipe for caramel sauce from my fave Dulce Delight. Use the #blottobotany on instagram to share your cordial recipes and photos!